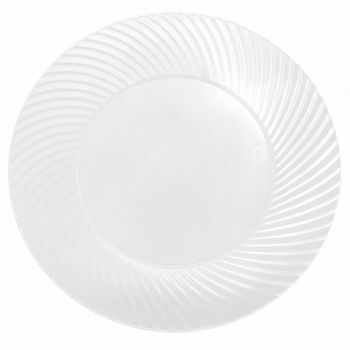 Product: 25cm/10" Clear Strong Disposable Plastic Dinner Plates with Swirl Design – Pack of 10 was added to cart. Proof that quality disposable tableware really does exist, Mashers 10” Clear Plastic Swirl Design Disposable Dinner Plates are strong, durable, and impeccably styled to complement all table décor. A fabulous choice for weddings, birthday buffets, corporate banquets, and simple family gettogethers, these clear plastic disposable dinner plates have a transparent glass-effect and a stylish swirl design. Washable and reusable, they offer excellent value for money, and they can be coordinated with the matching disposable side plates and bowls in the Mashers Swirl Collection to create a complete disposable dinner service.